Perfect We thought this was an excellent nights stay. Clean, comfy and excellent value! Central location, good facilities, great value & owners so accommodating with great service. 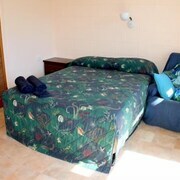 Great Room, Very Clean Rooms are very well set out, very clean and beds are comfortable. Great service. Nice BBQ area for guest use. Whale watching from the patio Amazing view and location. Good service and very spacious well appointed apartment! 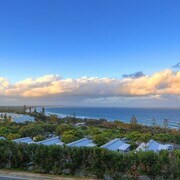 Get set to start spamming your mates' feeds with holiday pics of Rainbow Beach (sorry, not sorry). 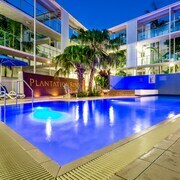 lastminute.com.au has a small but satisfying selection of 8 hotels within 5 kilometres of the centre. That means less time running around and more time for fun! Take a squiz at the Rainbow Ocean Palms Resort and Plantation Resort at Rainbow. They're not far from all the downtown action, so hit the snooze button and enjoy a well-earned sleep in! Take your mates for a throw of the Frisbee or a relaxing morning walk in Phil Rogers Park. Need a place to crash nearby? No probs, we've got you covered. 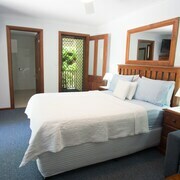 Rainbow Getaway Holiday Apartments and Rainbow Beach Resort are just a stone's throw away. Grab your gear and check out Wolf Rock Dive Centre. It's wonderful for an underwater experience. 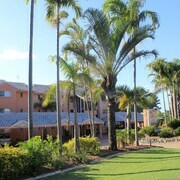 Debbie's Place and Rainbow Sea Resort are a couple of suitable places to crash if you don't fancy staying too far away. Still looking for somewhere to stay? Think about the Tin Can Bay Motel, 7 kilometres from the downtown area. If that doesn't suit you, look into the Rainbow Sands Resort, 1 kilometre away. Looking for more to do? Kick back and spend the day checking out the Lake Wabby and Great Sandy National Park. You'll find them in Eurong, 45 kilometres to the north of Rainbow Beach. 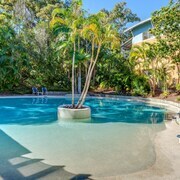 Eurong hotel options include the Eurong Beach Resort and Fraser Island Beach Houses. 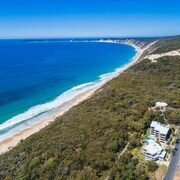 45 kilometres to the south of Rainbow Beach you'll also find Noosa North Shore, which is home to the Beach Road Holiday Homes and Noosa North Shore Retreat. If you're staying in Noosa North Shore, be sure to visit Noosa National Park and Noosa Beach. Sitting 55 kilometres northwest of Rainbow Beach is Maryborough, a regional centre with a population of 22,000. It's home to some sweet attractions, like the Mary Ann Steam Locomotive, the Maryborough Military & Colonial Museum and the Brolga Theatre and Convention Centre. Why not also see what's going on at the Customs House Interpretive Centre and the Mary Poppins Statue? Maryborough offers accommodation options to suit all budgets and tastes, such as the McNevin's Maryborough Motel and Blue Shades Motel. If you're holidaying with the squad and your flight hits the tarmac earlier than theirs, why not head over to the Akama Resort and put dibs on the best room? 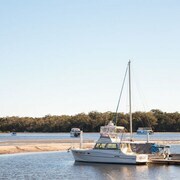 It's within a quick commute of Hervey Bay Airport, which is 70 kilometres from the centre of town.